Trying to slow down the cars, a new change in the rules established that for 1968, the Sports Cars were allowed to use a 5-litre engine and the prototypes up to 3 liters. The GT Class maintained its freedom in it’s maximum cylinder number. Ever since motor racing exists, the methods used to contain the top speeds of the cars have always been the same. It’s either by limiting the weight or the dimensions of the car, or engine displacement, by reducing it. And this last option was, definitely, what was used to limit the Europe-U.S. combat, which faced the Ford MkII and MkIV (7 litre engine, 520 BHP) and the Chaparral-Chevrolet against the Mirage-Ford (5,7 litre), the Lola-Chevrolet (4,5 or 4,9 litres) and the Ferrari P4 (4 litre, 430 BHP), so that it wouldn’t be necessary to do what was done in 1967. The Ford GT40 (Sport) and the Ford Mk IV (Prototype) had improved in 12 months what hadn’t be done –in the same proportion- in 6 years (lap records in qualifying and race, as well as average speed for the 24 Hours of Le Mans). So, the International Sporting Committee (I.S.C.) decided to reduce the maximum engine displacement, establishing a 3 litre limit for prototypes and 5 litre for the Sport category, obliging this last ones to produce at least 50 cars to gain access to this category. To set this straight, if a factory decided to enter the Sport category with a particular model, 50 units of such model should be constructed in order to be homologated. In spite of that, the battle sustained that particular year and the following one, favored I.S.C.´s reasoning. Not only did top speeds were reduced, but also the battle between Prototypes and Sport category was very close. And the numbers are eloquent: In 1968 –with Ferrari out of contention due to ending the P4 project and abandoning their participation in the Sport category, focusing exclusively in F1 and F2- it is Porsche who rises as the European flagship, and enters three 907´s (2915 cm3), one 910 and a 906 (1991cm3) in that year’s Le Mans, but although they did as much as they could to win the classic race, they were beaten by the Rodriguez-Bianchi couple in the Ford GT40, who took first place. Ford won most of the races that year, and as a consequence, the Championship. Other carmakers of the era were Alfa Romeo, Howmet, Alpine-Renault and Lola Chevrolet. In that season, Porsche introduced at Le Mans the 3-litre prototype that bared the 908 factory denomination. It’s eight cylinders bursted 2993 cm3. From this model, the 908 Spyder was directly derived, which would make its debut at Sebring, in 1969. The first 908 turned up at the 1968 Le Mans pre-test day in April. Its newly constructed 3-litre 8-cylinder engine delivered 370 hp at 8400 rpm. First success came at the Nürburgring 1000 kilometers in 1968 with Siffert/Elford snatching the overall win in the 650 kg lightweight. In 1969 the 908/2 Spyder replaced the coupe, which since then has only been seen as long-tailed versions for ultra fast circuits. From 1970 Porsche also entered the 908/3 Spyder for twisty events like the Targa Florio and the Nürburgring where it won in 1970 and '71. To summarize, notwithstanding that Porsche was the best of all the cars introduced, Ford beat them in and out, with a little help from the regulations. Según las normas oficiales debían contabilizarse solo un cierto número de clasificaciones y no el total de puntos acumulados a lo largo de la temporada, lo cual hubiese dado el triunfo a Porsche. But Porsche was more than willing to put up a fight. In April, 1968, the F.I.A. announced that as of 1969 only 25 cars would be required to homologate a particular model to compete in the World Manufacturers Championship. To obtain Volkswagen’s permission to build 50 of these units would have been utopist. But it wasn’t; by reducing the unit count by half and with the possibility that mighty privateers or wealthy drivers could buy it. It was only 90 days later, that Ferdinand Piech gets consent from his uncle Ferry Porsche to develop a whole new car, internally known as “Project 917”. 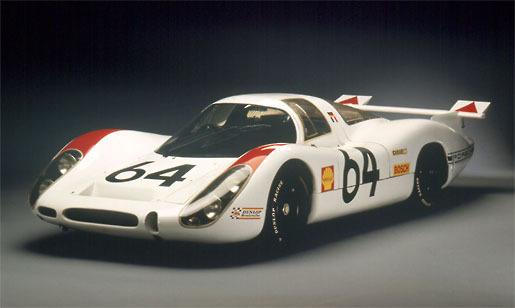 In less than a year was released for public consideration what would be Porsche’s ultimate weapon, with which it intended to take over the Sports Prototype Class. An excellent handling, but poor power in ti’s 3-litre engine. Such are the characteristics of the 1968 Alpine-Renault A220. A sure entry at Le Mans. The Bonnier-Muller couple drove the heavy Lola-Chevrolet. Its ony triumph came at the 1969 Daytona 24 hours. The maturity of the Alfa Romeo 33 2 liters (1968) was long and dreadfull. Accidents, deaths and changes in its structure were habituals. The Ford Mirage. A refined version of the Ford GT40. 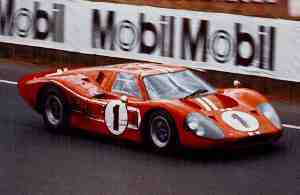 In the beginning it used a BRM engine, then in 1969 the Cosworth engine was installed.